Situated in Munich’s attractive Lochhausen district, just a 12-minute train journey from the city centre, this country hotel offers Bavarian cuisine and cosy rooms with free wireless internet. 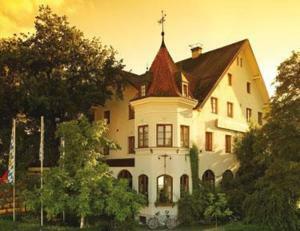 The family-friendly Landgasthof Deutsche Eiche provides cottage-style rooms and suites. A small fruit bowl and a selection of teas await you on arrival. A short walk takes you to the Lochhausen S-Bahn (city rail) station. Direct services run to the main railway station and Marienplatz square (15-20 minutes). You can reach the exhibition grounds in 35 minutes. The A96 and A99 motorways are about 5 minutes away. Use one of the hotel’s rental bikes to visit the nearby Langwieder See-Platte park area (2 km), or admire the Nymphenburg Palace. After a full day, return to the Deutsche Eiche’s rustic restaurant to enjoy some fine Bavarian cuisine, featuring fresh, local produce. During the summer, you can enjoy your meal in the attractive beer garden with its old chestnut trees, fountain, and relaxing music.